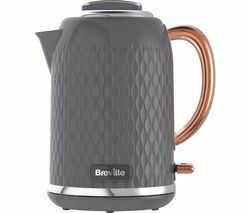 Our range of Breville kettles combine everyday practicality and attractive designs, with a variety of models and colours on offer. From simple stainless steel to bright colours, matching your Breville kettle to the all important kitchen colour scheme is a breeze. 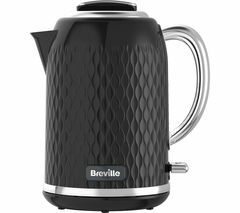 A Breville kettle offers great value for money too, with prices starting at under £20 for a basic stainless steel jug design. For the more fashion conscious kitchen the Impressions range looks great, with a smooth design these Breville kettles come in a variety of colours. An anti-limescale filter, 360 degree rotational base and large 1.7 litre capacity all make it as practical as it is pleasing on the eye. You can even take away the effort of pouring by choosing one of Breville’s hot water dispensers, which hold from one to five cups of water depending on the model, perfect for an office or those who work from home. If you really want to up your kitchen style then our Delonghi Kettles offer stunning designs and unique takes on traditional kettle shapes too. The Delonghi Brillante range comes with a 1.7 litre capacity, an easy fill spout, and a striking angled design that will look great in a modern kitchen. Our Morphy Richards Kettles also come in a variety of eye-catching styles, from the Accents range which put a colourful spin on the traditional style to the Redefine glass model with a totally see through body. Whether you want a simple kettle or a stylish kitchen accessory, our range has it covered.